I hope you had a lovely Easter, Mother's Day and my oh my: are you gearing up for graduation like we are? My son Caleb is on the cusp of exiting the 8th grade, crossing off each of these last days as 'mission accomplished.' It's almost mid-May! I think May and October might be my two favorite months. October is the thick of fall, full of crisp days and colored leaves. We decorate like crazy for Halloween, and are comfortable in our school and work routines. I find October very grounding. May in Seattle means my little shoots are starting to grow out of the ground, summer plans are coming together---and we can all just taste the forthcoming sunshine. It is the time of year James and I start taking early morning walks where we unabashedly adore our city, walk on the Burke Gilman trail near Seattle's Gasworks Park and peek into boutique windows while holding artisan coffees and still-warm almond croissants. May is the beginning of a parade of bountiful food that I can harvest for months on end, canning, preserving and enjoying my own little 'farm to table'. Just yesterday I plucked spinach from my garden boxes, tossing on homemade pesto, toasted pine nuts and some blue cheese crumbles. A glass of Washington State vino and I was happy as punch. This pasta salad includes a similar flavor profile. I hadn't made it for years, but with the season of BBQ's, potlucks and year-end parties upon us: it is a good one to pull from the coffers. 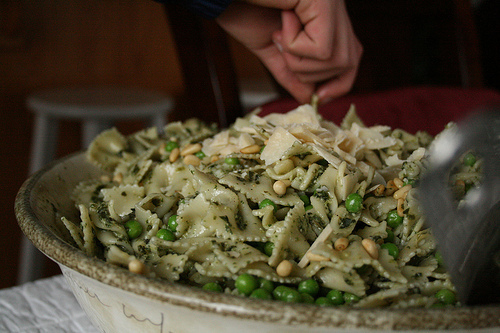 Pasta Salad with Peas, Pesto & Just-ground Pepper.Adopted from Ina Garten; page 101 Barefoot Contessa Parties All of my notes, misgivings, upgrades, rambling... TALK OF... is in green. 1 1/2 LBS mixed, dried pasta (she used bow-tie and fusilli; I used whatever remnants were in my cupboard...) 1/4 cup good olive oil (ingredients count! Read about when I went to an olive oil tasting in Italy!) 1 1/2 cups homemade pesto 1 10 oz. pkg. frozen chopped spinach, defrosted and squeezed dry (OR you could go out on a limb, pick that spinach in your garden and quickly sautee it or pop it into boiling water/vegetable broth - pop into quick ice bath to shock/stop the cooking/lock in the flavor THEN squeeze dry...) 3 T freshly squeezed lemon juice 1 1/4 cups good mayo (for me that ='s homemade; find recipe and mayonnaise-making method here) 1/2 cup Parmesan Cheese (or Grana Padano - yum! Ideally you bought a wedge and create large shavings or gratings so this glorious cheese stands out against the pesto) 1 1/2 cups frozen peas, defrosted (my vote: go for fresh, give them a quick 2 minute visit in a tiny pot of boiling vegetable broth then a quick shock: use a strainer, scoop peas, then put same strainer into ice water bath to stop the cooking/freeze in the gorgeous pea color - 20 - 30 seconds at most). 1 tsp coarse salt or sea salt 1 tsp coarse pepper 1/3 cup toasted pine nuts (I know: very expensive right now. But it just takes a few to make a world of difference. NAILS the flavor profile. And if you buy a gigantic bag like I just did at Costco - store in the freezer). [In my words]: Cook pasta in boiling salted water until al dente. Run under cold water in sink, in colander. Then add a teeny tiny drizzle of olive oil to toss the pasta - just enough so the pasta doesn't stick. In food processor, puree pesto, spinach and lemon juice. Mix in mayo. Combine this mix with pasta; stir in the Parmesan, peas, pine nuts and add salt and [coarsely ground] pepper to taste. I really think just-ground pepper is underrated. Be liberal with your pepper grinding - pepper rocks. May 15 Fancy, summer water.